Ever been jolted with electric current? Like the time you’d just gotten out of the shower and went to plug in a lamp with damp hands? So what do you think the voltage was that caused that nasty biting feeling that resulted from your momentary lapse in good judgment? Once, while operating a subway car at a railroad museum at which I was a member, I was inadvertently “electrocuted.” I went to turn on the lights inside the car, and unbeknownst to me the light switch was faulty. When I touched it I instantly became connected to the car’s 600 volt lighting circuit. With just a split second of contact the current passed through the tip of my right index finger, along my right arm, down the right side of my body, and out the tip of my big toe, finally exiting into the metal railcar’s body. The current actually burned a hole where it had exited through my boot. The experience was both frightening and painful, but fortunately did not result in any real injury. I was lucky that the current had bypassed my heart, because if it hadn’t, I might not be alive today. That was 600 volts. Now imagine being jolted by the 4000 volts present in a microwave oven’s internal high voltage circuitry. Last week we discovered how the high voltage circuit in a microwave oven converts the ordinary, everyday 120 volts alternating current (AC) present in our homes into a much higher voltage approximating direct current (DC). This is done by an internal component known as the capacitor. 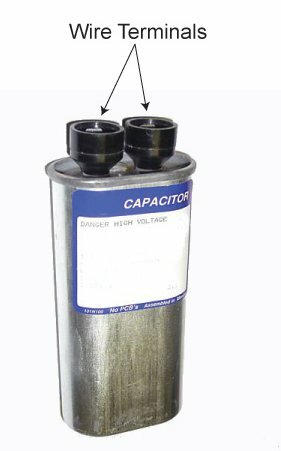 The capacitor is capable of storing large amounts of electrical energy, and this can result in microwave ovens presenting a danger even when unplugged. 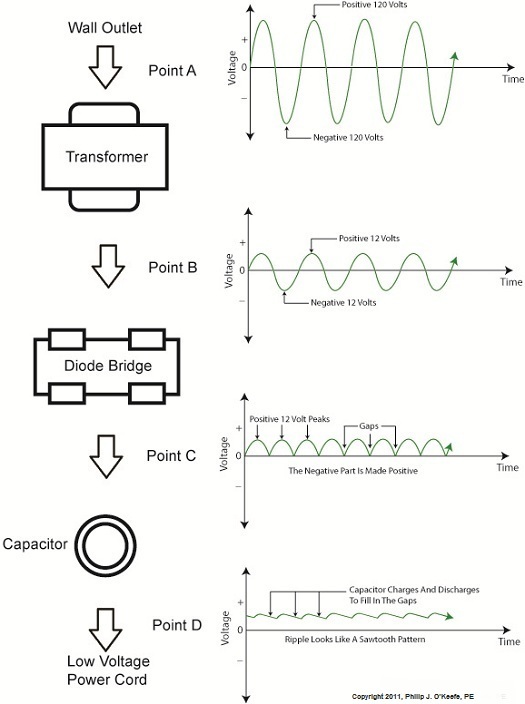 A microwave oven capacitor is shown in Figure 1. If you happened to touch its wire terminals while it’s still charged, its power can rapidly discharge high voltage electrical current throughout your body. The electrical current from the capacitor can even stop your heart from beating, and this is exactly what caused the demise of a person featured on a soon to be released Discovery Channel program, Curious and Unusual Deaths. While being interviewed as an expert for the program, I was asked to explain this rather unique phenomenon of latent stored energy, and how it may present a threat. 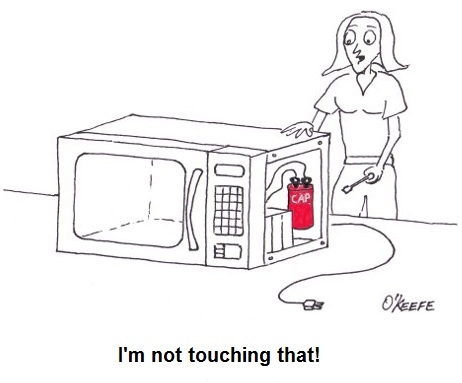 Remember, a microwave oven capacitor can remain charged with dangerous electrical energy for hours, even days, after the microwave oven plug is pulled from the wall outlet. The bottom line here is that you should not attempt to fix your microwave oven, unless you are trained and certified to do so. Next week we’ll switch to a different topic, namely an electrical device known as a “wall wart.” That’s the black plastic adapter you plug into electrical outlets to power your cell phones, laptops, and other small electronics. The evolution of cooking methods has been interesting indeed, from the open fires of primitive man, who must have decided at some point that cooked meat tasted better than raw, on to wood fired stoves, fossil fuel-based cooking, whether coal, propane, or gas, and let’s not forget electric range tops. Standing on its own in the modern kitchen is the microwave oven. What will be next? The space age food pill dispensing stations of the futuristic cartoon family, The Jetsons? We’ve been talking about resonant cavity magnetrons and the purpose they serve within a microwave radar system. 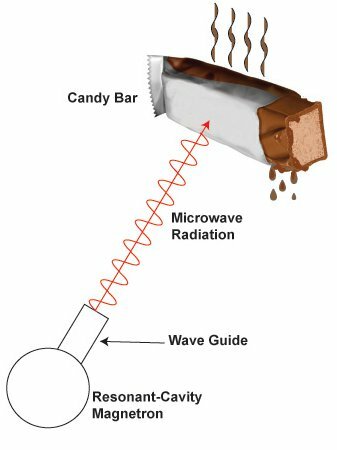 We also learned about Dr. Percy Spencer’s discovery and how microwave radar transmissions emanating from a magnetron can cook food, not to mention melt candy bars. Although the technologies used in microwave radars and microwave ovens are similar, they do have important differences. It would be both unsafe and impractical to install microwave radar systems into kitchens. Radiation emitted from radar wave guide lacking proper containment would bounce aimlessly around the kitchen, posing a threat to human safety. You see, microwaves don’t know the difference between our bodies and the food we wish to cook. They’ll heat up human tissue just as readily as a bowl of chicken soup. Another issue is that runaway microwaves lose much of their effectiveness through their aimless bouncing about, and much of it would not be directed to the food itself. Dr. Spencer would learn how to corral that energy, making microwave cooking a commercial success. The biggest problem for Dr. Spencer to overcome was containment of the microwaves. They needed to be directed towards food in order to efficiently heat them. His first microwave oven was a metal box containing an opening at the top into which a magnetron wave guide could be inserted. This would then introduce microwaves into the box, and the metal construction of the box would safely contain them. The safety issue had now been resolved because the waves couldn’t escape, they would simply bounce around inside the box and most of their energy would be transferred into any food placed inside. Dr. Spencer’s employer, the Raytheon Corporation, produced the first commercial microwave oven in 1954, and it was appropriately named the “Radarange.” It was huge, almost six feet tall, and weighed in at about 750 pounds! Hardly something that could fit into a home kitchen. Despite its massive size, the Radarange wasn’t all that powerful and couldn’t compete against the compact countertop microwave ovens in use today. It wasn’t until 1967 that technology improved enough to give us the smaller, more efficient units affordable to consumers. This improvement involved using a newly developed semiconductor device called a “diode” within the high voltage electric circuitry that powers the magnetron. We’ll learn more about these technologies in our next post. Also in our next post, we’ll see how high voltage circuits can pose electrocution hazards in a way you‘d never expect. I discussed one of these instances in my recent appearance on The Discovery Channel program, Curious and Unusual Deaths, soon to be aired. Ever discover a melted candy bar in your pocket? You immediately start to think about the sources for the heat that had caused the mess. Did you stand too close to the stove, were you outside in summer heat too long, or did you simply sit on it? Or was it perhaps caused by being in proximity to a whirring device, something which does not seem to generate any heat at all? If you’ve been reading along with us, you know what device I’m talking about. Last time we talked about an effect known as cavity resonance and how a sound is created, much like a musical note, when we blow across the top of a glass pop bottle containing some air space. Our breath causes the air molecules to bounce in and out of the bottle’s cavity, producing the sound. Microwave technology works in much the same way, making use of an electronic device called a resonant-cavity magnetron. But instead of generating a musical tone, like our breath does over the bottle, the magnetron produces short wavelength radio waves, known as microwaves, and it was initially developed to generate these microwaves for radar systems. So, how does the magnetron work? The magnetron contains a series of cavities arranged in a circle, their openings pointed towards the center as shown in Figure 1. Engineers determined that when a high voltage, say 4000 volts, is applied to the magnetron, it begins to boil off electrons through a filament, called a cathode, located at its center. Once free of the cathode, the electrons want to flow to a part of the magnetron called the anode. 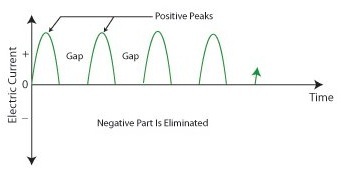 This is because the cathode is positively charged and the anode is negatively charged, and as we know, electrons like to flow from positive to negative. The anode is also the part of the magnetron containing the cavities, and we’ll see the significance of this in a moment. Before the electrons can take their desired straight path to the anode, they are deflected by powerful magnets located on either end of the magnetron. These magnets force the electrons to move in a circular pattern over the openings in the cavities. Like the air molecules passing over the top of a pop bottle when you blow across it, the electrons move over each cavity opening in the magnetron, creating not musical tones, but microwaves. The microwaves are then collected from the magnetron using an antenna and directed along a tube called a wave guide. The microwaves leave the wave guide when they are transmitted by radar systems. The radar system then transmits the microwaves towards moving objects they wish to track. These tracked objects are as diverse as airplanes, ships, and weather patterns. See Figure 2. So, how does the microwave oven fit into our discussion? In 1946 an engineer by the name of Percy Spencer was working on a radar magnetron for the Raytheon Corporation, a producer of electronic technology for industry and defense. During the course of his work he unexpectedly exposed himself to microwaves from a wave guide, and he couldn’t help but notice that the candy bar in his pocket had melted. Putting two plus two together, he realized the microwaves had caused the candy bar to heat up. Dr. Spencer further experimented and came to the conclusion that microwaves can cook foods far more quickly than conventional ovens, and the modern day kitchen appliance was soon born. Next time we’ll look at how Dr. Spencer’s microwave cooking discovery was developed into the microwave oven we find in most kitchens. We’ll also see how even an unplugged microwave oven can pose an electrocution hazard, as I explained in the Discovery Channel program I was recently featured on, Curious and Unusual Deaths. In the world of inventions it happens with some regularity that an invention to do one thing unexpectedly leads to a device that does something completely different. Take for example Edison’s phonograph. At the time, he was working on an invention to record the dots and dashes of Morse code telegraph messages so they could be sent out repeatedly without an operator having to tap them out each time and possibly making mistakes while doing so. Little did he know that this would lead to the evolvement of the phonograph and recording industries. Another invention “by mistake” took place when the resonant cavity magnetron, originally developed for use with microwave radar, led to the development of the microwave oven. Last week we talked about how long wave radar, the first type of radar to be developed, was effectively used by the British to repel enemy air attacks during World War II. But long wave radar was large and cumbersome to employ, and it soon evolved into an improved version, the shorter wave, or, as we know it, microwave radar. So what is this resonant cavity magnetron that led to its creation? A pop bottle can give us a clue. Blow across the top of an empty glass pop bottle (or soda bottle, depending on the part of the country you’re from) and a familiar resonant sound results. The sound is created by an effect known as cavity resonance, and other bona fide musical instruments make use of this phenomenon to produce musical sounds. How this works is that where a cavity exists, when air molecules are introduced into it, the molecules are caused to resonate in and out of the cavity many times per second. This creates a sound at a certain frequency, that frequency depending on the shape and dimensions of the cavity, as well as the size of its opening. 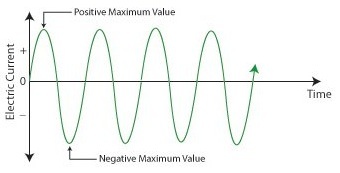 The resonant cavity magnetron, or magnetron for short, is actually a high powered vacuum tube that operates in a very similar fashion to a pop bottle, or any other musical device making use of a cavity, but instead of using air molecules to generate sound waves, it uses electrons to generate short wavelength radio waves, called microwaves. 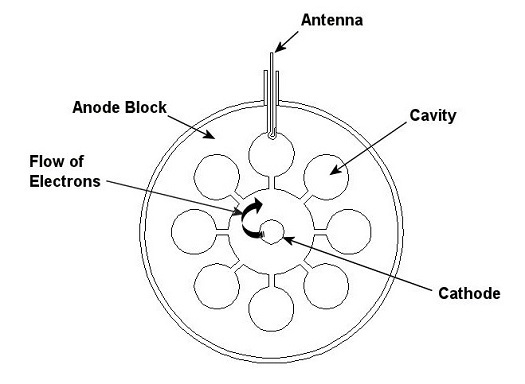 The magnetron contains a series of cavities that are arranged in a circle with the openings pointing inward towards the center, as shown in Figure 1. Next week we’ll see what this interesting looking device has in common with the simple act of blowing air across the top of a pop bottle and what this all has to do with microwaves. Pop some corn, defrost meat, quickly heat a frozen dinner. What modern day miracle is capable of doing all this and more? The microwave oven, of course. They’ve become an integral part of modern kitchens and our lifestyle. Did you ever wonder how they came to be? We’ll have to turn back the hands of time over 70 years to the dark days of World War II to find out. WWII began when Adolph Hitler’s Nazi regime conspired with Joseph Stalin’s Soviet Russia to invade Poland in September, 1939. From there, German forces went on to sweep across much of continental Europe, and even as far as North Africa and the Middle East. In the face of these and future war maneuvers, Great Britain remained our ally and a significant force to be dealt with. Although Hitler was intent on bringing the British Empire to it knees by means of aerial bombardment, he did not succeed. He failed to take into account the fact that the British Royal Air Force Fighter Command had a unique advantage over his German Luftwaffe– or Air Force to those of you not up on your German. The advantage was called RADAR, an acronym for RAdio Detection And Ranging. Thanks to this proprietary technology, the British Fighter Command was able to detect incoming German warplanes well in advance of their arrival over British soil, and this provided British pilots with enough time to scramble their fighter planes and get a jump on their attackers. Although horribly outnumbered, the Royal Air Force planes managed to inflict heavy casualties on the Luftwaffe. In fact, this Battle of Britain, as it came to be known, marked the first defeat of Hitler’s military forces during the war. So how does this modern marvel of RADAR work? Simply stated, it transmits radio waves from an antenna. When these waves strike an object, say an approaching German airplane, some waves are reflected back to a special receiver antenna. The reflected radio waves are then converted by the radar system into a “blip” on a viewing screen. A radar operator stands at the ready, trained in the art of interpreting radar blips. 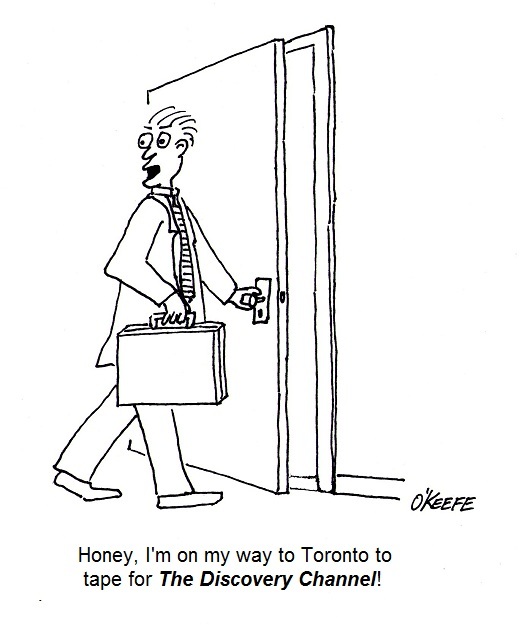 He or she is quickly able to assess the approaching object’s position, direction of travel, and speed of approach. Although the ideas that led to the development of radar had been around for some time before WWII, it wasn’t until the late 1930s that engineers began developing it for air defense purposes. They first developed what was called a long wave radar system, referring to the fact that the radio waves transmitted had a long wavelength, about 1.5 meters. The British, at the top of their game, had anticipated the Nazi threat and installed an array of these on their east coast by 1940. Although long wave radar worked well enough during the Battle of Britain, it required massive, land-based antennas to operate, which proved to be cumbersome. It also couldn’t give operators a good idea of how many planes were approaching. 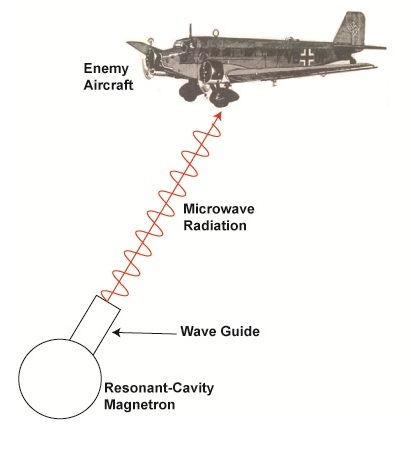 Then, just months before the beginning of the Battle of Britain, British researchers developed an ultra top secret device they dubbed a “resonant-cavity magnetron,” or magnetron for short. This magnetron was capable of producing short radio waves, in the range of 1 to 10 millimeters, and these came to be known as microwaves. The technology mastered in the magnetron opened the door to an improved radar system, one which became mobile. These systems were more easily installed on aircraft, ships, and land vehicles. Microwave radar was also found to be better at detecting small objects than its massive predecessor technology. 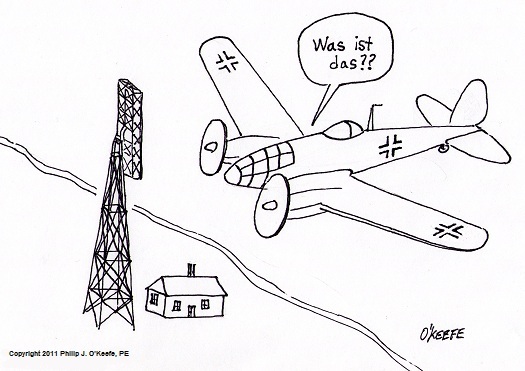 Unfortunately, microwave radar couldn’t be put to use in time for the Battle of Britain, but it did play a pivotal role in the defeat of Axis, that is the opposing side’s, forces during the remainder of WWII. Next time we’ll take a closer look at the resonant cavity magnetron and find out how microwave radar led to the development of the famous oven that bears its name.